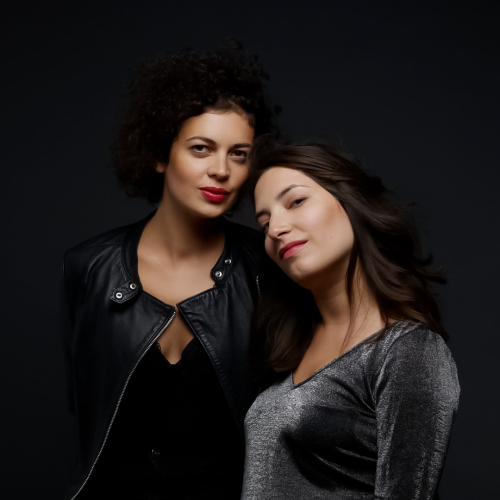 Adélaïde Panaget and Naïri Badal met at a very young age when they were taking the same piano lessons and they developed a similar approach to the instrument. After their time at the Conservatoire de Paris, where they were taught by Brigitte Engerer and Nicolas Angelich, they improved their skills with Claire Desert and Ami Flammer. In 2007 their friendship and shared artistic sensibility led them to create Duo Jatekok, which quickly emerged as one of the most promising duos of its generation. They have won many international competitions including in Ghent in 2013 and Rome in 2011, as well as the contemporary music prize at the Forum Musical de Normandie in 2012. In addition, they were artists in residence at the prestigious Queen Elisabeth Music Chapel in Belgium, under the direction of the Artemis Quartet. The energy and enthusiasm they bring to their performances has earned them regular invitations to festivals and international stages such as La Roque d’Anthéron, Les Folles Journées, the Debussy Festival, Festival à la Française and many others. They have also preformed at Cité de la Musique in Paris, the Royal Theatre and Flagey in Brussels, as well as the National Opera in Warsaw under the direction of Arie Van Beek with the Sinfonia Varsovia. In February 2015 they will present their CD ‘Danses’ (Barber, Grieg, Ravel and Borodine) for the Mirare label. Always keen on discovering new pieces, they juggle their classical repertoire and creating contemporary works, and enjoy bringing actors, musicians, dancers and composers together for original projects. In 2013 they created the Jatekok Quartet with percussionists from the Paris Opera and the Orchestre de Radio France, Jean-Baptiste Leclère and Nicolas Lamothe.